I don’t generally eat at, nor review hotel restaurants but, here in the northern city of Iqaluit, the only restaurants that offer anything close to fine dining are all situate in, albeit not necessarily owned by, the four local hotels. The other three restaurants are pretty much snack type places (although the food is pretty good in a couple of them) and, as such, the dining options in this part of the country are fairly limited. The restaurant adjoins, and is associated with a rather cozy little bar called the ‘Kickin’ Caribou Pub’ that occasionally has musical entertainment and serves pub type food. I have eaten there a couple of times and, on my last visit, enjoyed their fish and chip platter, which is as good as any I have tried elsewhere. 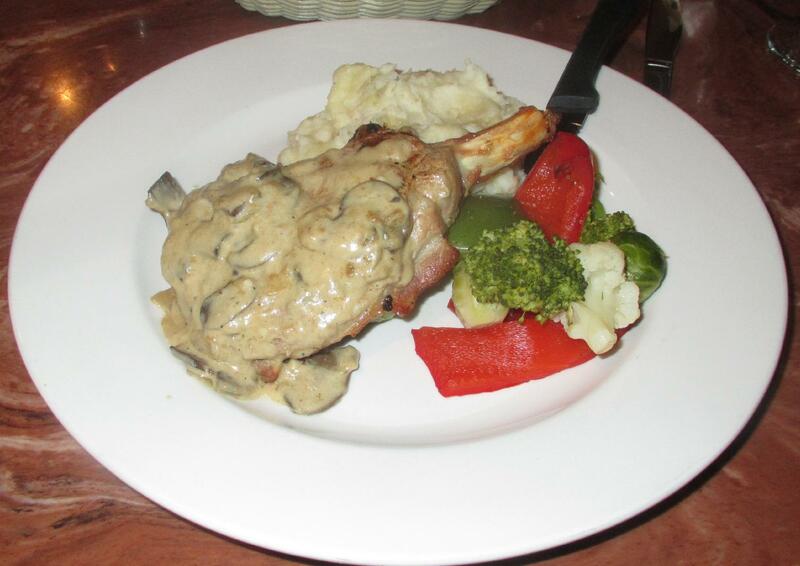 The main restaurant has a more varied menu which, though fairly limited, features steaks, seafood and pasta. The website for the restaurant claims that the place seats 120 but I only counted some 60 chairs. 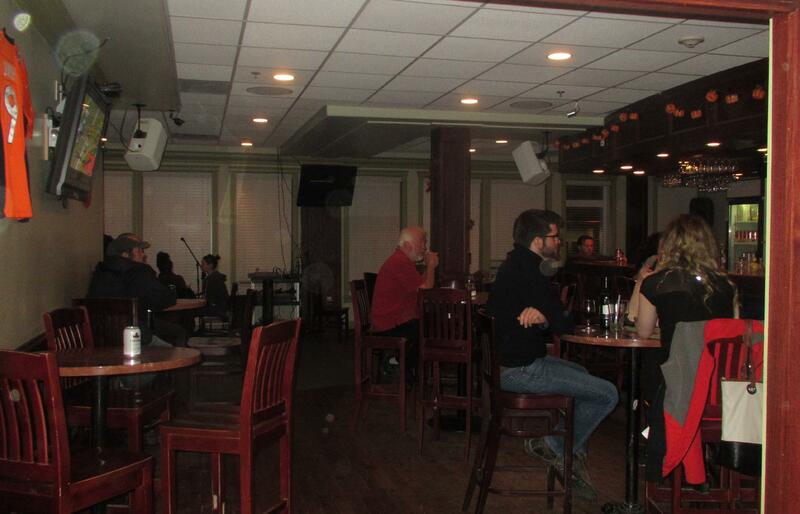 There is however, quite a lot of room in the place so quite possibly other tables are added as the need arises. My wife and I arrived at about 5:30 pm and there was only one other couple seated thus far. During the whole evening only about a third of the seats got filled but since it was a holiday Monday, when most people eat at home with friends and family, this was not too much of a surprise. Generally, the place is nicely appointed and quite comfortable and we were seated at a very nice table for two by the large front windows. Our waiter, for the evening, was a pleasant young lad who was on duty alone initially (although a second waiter arrived a bit later on). He was, on the whole, very attentive and efficient, although he did seem a bit confused when it came to beverages. When my wife inquired as to what Single Malt Scotches were available he suggested a ‘Gordon’s’ which, as my wife pointed out, is a brand of gin. We didn’t actually care about this but I believe you can still get the death penalty for such an error in Scotland. Anyway, all beverage gaffes aside, the service for the evening was as quick without being pushy, extremely courteous, and, I have to say, better than is often encountered in Iqaluit. 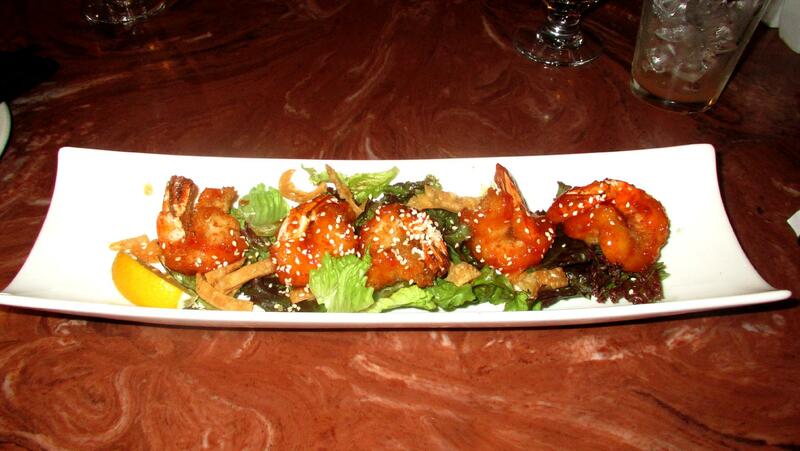 ‘Bang Bang Tiger Prawns’ – My wife and I shared a plate of these as an appetizer. She has enjoyed them here before and, since there is little on the Appetizer menu other than Calamari that really appealed to either of us, she was happy to have them again. There were five Prawns which appeared to have been lightly dredged in flour before being deep fried and then served with a ‘Sweet Chili Thai Sauce’ and sprinkled with sesame seeds. Personally, I would have liked this to be a little less sweet and a little more spicy- hot but I would say that the way they do it here is probably more appealing to the regular patrons and I rated it at a 4 out of 5. Grilled 10oz Pork Chop – This was my entrée. It came with mushrooms and onions in a herbed cream sauce, garlic mashed potatoes and a mélange of fresh vegetables that included Brussels sprouts, broccoli, cauliflower and red and green bell pepper. The chop was a good size and nicely tender and the sauce was a nice accompaniment. It should really have been just a little thinner, and there could have been a bit more of it, but, in all honesty, it was as good as any I have made in my own kitchen. The vegetables were not quite the quality as one would usually get down south in a decent restaurant, but I put that down to the difficulties of getting the best produce up here in the north and I was happy to see that they were fresh rather than frozen. I enjoyed this very much on the whole and gave it a 4 out of 5. 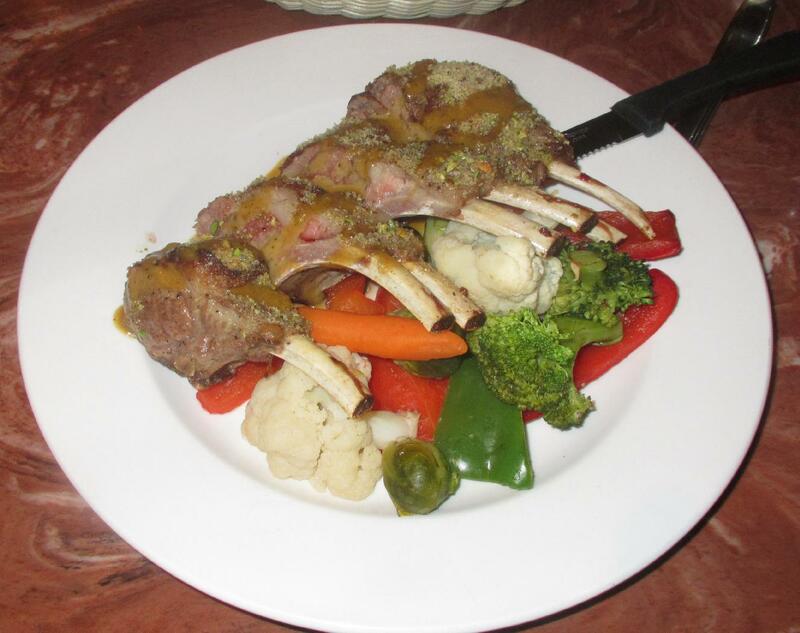 New Zealand Rack of Lamb – My wife’s main course really was the star of the show on this night out. It was 7 ribs encrusted in crushed pistachio, drizzled with a honey Dijon, and served with the same sort of vegetables I had (my wife declined the potato). I was given one rib to try and I have to say that it was the best and most tender lamb I have ever had in a restaurant, and I am sad to say, better than any I have ever cooked myself. The waiter brought out the chef when we expressed our pleasure and my wife told him that she has had a rack of lamb at Maxim’s in Paris and that his was even better. I will definitely be ordering this on my next visit and my wife and I both agree it deserves an unstinting 5 out of 5. This was the first time my wife had been out together for a meal in quite some time and this experience really made up for that. 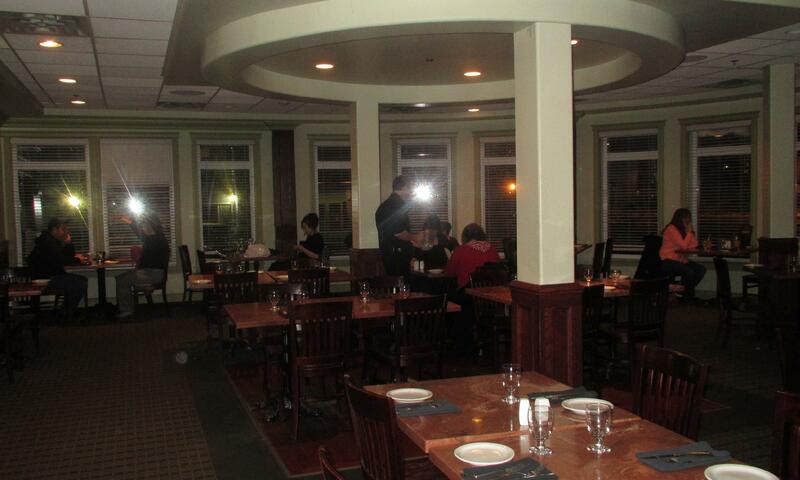 The service was excellent, the ambience pleasant, and the food very good indeed. My only real criticism was that I found the plating and presentation to be a bit unexciting, but that is a small point given everything else and I rate the place at a solid 4 out of 5. I’d say this was pretty good considering the location. I wonder how the rack of lamb was cooked. You should be able to reproduce it at home with the help of an instant read thermometer with a probe, provided you can get good (young!) lamb of course. I think it was the quality of the lamb that really made the difference…. I usually managed to get the right degree of ‘doneness’ and pretty decent flavor, but the tenderness here was exquisite. The name of the restaurant may seem to be a bit of a misnomer as it is nowhere near the water, however the name came from the two sisters that established it and own it – both with the last name of Water. So, its a bit of a play on words!